Whether you are setting up a completely new business or you have been in business for a while, costs are always an issue. One area where more and more people are realizing that they can cut costs is in the area of telephony and communications. Modern technology gives you a plethora of services from which to choose when getting a phone line for your business. Before you decide on one to get started with or to switch to, take some time to compare them all together. This article looks at the different options for business phone lines and is a guide to help you in selecting the one that’s right for your company. Before actually looking at these services, let's clarify what exactly is unique about a phone line for your business. If we look at this from a very basic perspective, there is in fact nothing unique. After all this is just another phone line and number that you can use to make and receive calls. However, when you start to dig deeper, business phone lines and plans offer a wealth of features and capabilities that can truly make a difference in the effectiveness and productivity of running a company, no matter how small. While it really comes down to the specific needs of each business, some examples of these features are automated attendant, call recording, automatic call distribution, find me follow me, and mobility among many, many more. While reading the following options, think about what your business really needs in addition to what it might need as the business grows. What are Virtual Phone Systems? Also referred to as Find Me, Follow Me or Virtual Phone Number Services, these solutions let you direct calls from a new number to an existing device. This includes desktop phones, computers and Smartphones. Right off the bat, you save money by not needing new phone hardware with a new number. Local, toll-free and international numbers are all available as are extensions so you can accommodate teams of various sizes with a single number. If you prefer to have altogether unique phone numbers for different people versus simply different extensions, you can do that as well. As far as functionality, virtual phone systems offer amazing flexibility. Anything you can do with a standard phone system, you can do with this - and more. For example, you can block, forward and record calls, set up phone menus and customized voicemail greetings, host virtual meetings, fax, text and select special outbound caller IDs. Note that this service is typically only for inbound calls, so don't count on it for outbound calls unless the service you select specifically states these are included and provides a mobile app to enable them. Also be aware that per minute usage fees are typically high after you have used up your monthly included minutes. Not much in the way of new hardware. You will need to choose the device or devices that your business number will ring to and that’s about it (unless you simply want an excuse to buy new devices). While there are some plans that run as low as $9.99 per month, there will be very few minutes included and overages will quickly become expensive. A good option for many small businesses is a 1,000 minute plan and these typically cost about $19.99 per month. Who are some of the popular providers? Grasshopper, eVoice, VirtualPBX and RingCentral are just some of the providers that offer this type of solution. On the outside, these solutions might seem similar to standard office phone systems. Users will have desk phones and individual numbers or extensions from a main number. But, instead of voice data being transmitted via traditional PSTN lines, it travels via the Internet. While this dramatically reduces costs for calls, selecting a hosted business VoIP service also reduces the overhead for maintenance and infrastructure. Management of these solutions is much simpler than managing a legacy analog PBX switch and ownership will become part of your organization’s overall network management. VoIP services can also work with different types of phones so that you can get calls while travelling. This includes cell phones and softphones, calls made via a desktop or laptop computer. Conference calling, texting, faxing and more are all possible with these solutions. You can enjoy a wealth of features such as call blocking, parking, forwarding and recording or a virtual mailbox and receptionist. One key differentiator with this service is that the service includes both inbound and outbound calling. Because you can use your existing phone hardware or other devices, there should be little investment needed in this area. You will want to ensure that your network and Internet bandwidth can support the addition of VoIP, and also understand what each person’s needs are. For example, some people may wish to use softphone functionality while desk phones alone may be sufficient for others. The cost of a hosted phone line for your business will typically depend on how many lines you need. The more lines, the lower cost. That being said most so called unlimited calling plans will cost in the region of $25 per line per month. There are two key catches to watch out for when it comes to pricing. The first is that there is really no such thing as a truly unlimited calling plan and every provider offering such a plan will have reasonable usage limits in the small print. The second is that some providers offer plans that are based on the number of minutes that are included each month. While the stated price of these plans likely seems cheap in comparison to others, the per minute overage rates will be extremely expensive. So be very wary of these marketing gimmicks. Although there are a lot of them, they are certainly not all offering the same level of service. To check out the most popular options and to read user reviews, visit our business VoIP provider review section. How are these used by Businesses? Many one-person outfits (or even small companies) may be tempted to use their existing cell phone numbers for business purposes. This is understandable yet it comes with some pretty big drawbacks the first of which is the overlapping of personal and business lives. It will also make separating which costs are business versus personal difficult - and this will be important when tax time rolls around. Certainly, this option seems better than toting around two cell phones, one for work and one for personal needs but the downsides could still pose problematic. Using your existing cell-phone to make business calls will result in your customers seeing your personal caller-ID when you make a call. While this might not be a bad thing in some cases, it does mean that they will then be able to contact you 24/7, even when you are on vacation. Although there have indeed been many amazing technological advances in cell phone technology in recent years, the call quality still does not come anywhere close to that of an IP phone. You are also at the mercy of cellular signal strength if you are not on a wifi network. Yet another thing to consider if you are thinking of going in this direction is how often you would typically use your speakerphone. While you can likely use a Bluetooth device to get around this when you wish to go hands free, it is never going to be as convenient as pushing a button on a desktop phone. All you’ll need is your existing Smartphone and you can be up and running. You may need to change your plan to cover new volume of data use or even calls if you are not on an unlimited plan. The answer to this is "it depends". If you are simply going to use your personal cell phone for business then there is a good chance it will not cost anything extra. If you are going to be purchasing new cell phones for employees then you will pay a hefty price not only for each phone, but also for the monthly service fee. Costs will likely be in the region of $50 to $100 per phone per month. If you really want to use an existing cell phone for your business calling, we highly recommend also using a virtual phone number service such that your company presents a professional image to customers and provides a main company number that is different from your personal number. AT&T, Verizon, T-Mobile and Sprint are currently the most popular choices in the USA. There are also the less well known, lower cost cell phone providers such as Republic Wireless, Tracfone and Virgin. Do you remember what these are? These are your standard legacy landlines provided by your local phone company. It wasn’t all that long ago when ordering a new landline would have been the thing to do. While this option still exists today, the costs for these services typically put it out of the ballpark for most small businesses. If you’re considering using an existing personal landline for a new business venture, you will run into the same issues that you would by sharing your personal cell phone for work. Additionally, these options provide fewer options for folks who want access while on the go, in addition to a very limited feature set. New DECT or other phone hardware will be required. The costs for this will vary based upon how many lines you intend to have. How much will it cost and who are some of the providers? You can still get a traditional landline from your local telephone company. Providers such as AT&T and Verizon will charge around $50 to $60 per month per line. Several new services have entered the scene that let you use existing phones and make Internet-based calls for free. Viber, Google Voice and Skype are just a few of the offerings in this space. The free price tag is alluring indeed but buyers beware - calls are only free when in-network. Call someone not on your Viber, Google Voice or Skype network and watch the price tag go up and up and up. All you need is your existing cell phone with the appropriate app installed. This is really only an option for the technically savvy that are interested in building their own phone switch to avoid signing up with a service provider. You will need to own or have access to a server while ensuring the server specifications can accommodate the call volume that you are planning to implement. Open source software such as Asterisk, FreePBX or FusionPBX (based on FreeSwitch) must be installed onto the server followed by proper configuration. Open source software is indeed free but it will take time and effort to get these systems up and running. As such there is an intangible cost related to the time and effort involved with installing, configuring and maintaining these solutions. In addition, you will still need to use a wholesale VoIP provider to get access to a carrier and connect your calls to the PSTN, so there will still be a low per minute usage rate for each and every call that is made or received. Let's now look at a comparison of all six options described above. Here are the definitions for the following table: VPS = Virtual Phone System; BV = Business VoIP; CP = Cell Phone; LL = Landline; FVS = Free Voice Services; DIY = Do-it-yourself open source PBX. 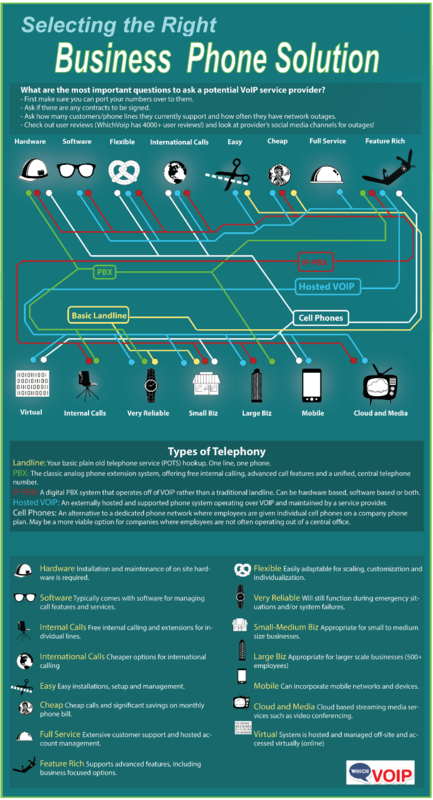 For completeness we have created an infographic highlighting all of these business phone solutions. Once you determine which type of telephone communication you want to use, you will then need to research providers, plans and costs (again, remember that "free" is not always free). What is the Best Phone Line Option for your Business? So, now that we’ve taken a look at all of the options you have at your disposal, it’s time to decide which of these really makes the most sense for your business? If you’re looking for a truly professional and reliable business communication system, virtual phone number services (Find Me Follow Me) or hosted VoIP solutions are the way to go. Both of these provide all of the functionality most businesses would need with plenty of room to grow. To that point, starting with a virtual service is often best for smaller businesses and then migrating to a fully featured hosted VoIP solution down the road as growth occurs.